The TV coverage of Super Junior’s concert titled Asia MYX: Super Junior Special will air this Monday, April 19, at 8:00 pm. Super Junior fans who missed the group’s April 10 concert will have the chance to watch it on music channel MYX. 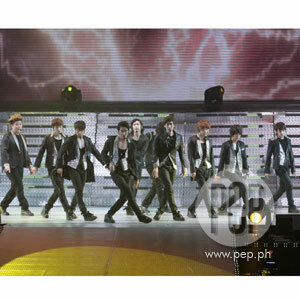 The TV coverage of the concert titled Asia MYX: Super Junior Special will air this Monday, April 19, at 8:00 pm. The said MYX special will include exclusive footages from the Super Junior press conference and sold out three-hour concert. Also, the TV special will present the "MYXclusive" interview of VJ Iya Villania with one of Korea’s pop superstar acts. Produced by MYX and Pulp Live Productions, the concert was recently held at the Araneta Coliseum as part of their Super Show 2: Asia Concert Tour Live. Super Junior is the first Korean pop boy band to have three number ones simultaneously on MYX charts—MYX Daily Top Ten, MYX International Top 20 and MYX Hit Chart—for the music video "Sorry Sorry-Answer." The group is also the first K-pop band to have two number one hits on MYX charts for the music videos "It’s You" and "Sorry Sorry-Answer." Catch Asia MYX: Super Junior Special at the following dates and times: April 19, 8:00 pm; April 21, 9:30 am; April 22, 4:00 pm; and April 25 at 12:00 midnight and 11:00 am. MYX is available on Channel 23 of SkyCable and other quality cable companies all over the Philippines.